Who is considered to be a U.S. person for tax purposes? 1. Who is a U.S. person? What is the difference between a U.S. citizen and U.S. person? 2. I am a U.S. citizen living and working overseas, should I file a tax return? 3. I am a green card holder living abroad, am I still taxable? 4. I am a resident alien. What do I need to know about my tax obligations? 5. I am a nonresident alien, what do I have to report? 6. I have dual citizenship, should I still file taxes? 7. Who are Accidental Americans and how do I know if I am one of them? The rules of U.S. citizenship are complex, anyone who is born a U.S. citizen or considered to be one under U.S. nationality law is subject to tax unless they renounce their citizenship. You do not necessarily need to have an American passport. For example, an accidental American is an individual who was born in the foreign country to one U.S. parent, who emigrated from the U.S, or was born in the U.S. and then returned to their own country in early childhood. If you were born outside the U.S., have dual citizenship, and have never lived in America, you will be considered a U.S. person for tax purposes, and are still obligated to report and pay U.S. taxes until you terminate your U.S. citizenship. Green card holders and tax residents are also subject to U.S. income taxation on their global income. Those whose green cards have expired after moving back to their country of origin, and have never formally canceled their U.S. immigration status, still have to file their U.S. tax returns. Even if they are not in the U.S. anymore, green card holders need to remember that their tax responsibilities do not change until they surrender the card or there was a final administrative or judicial determination to revoke or abandon it. Even if your green card isn’t valid anymore, you are still obligated to file tax returns until there has been a final determination that your green card has been revoked or abandoned. 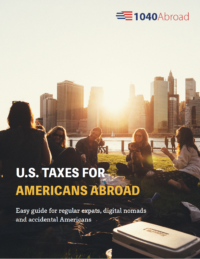 If you are a U.S. citizen who is currently living and working abroad in any foreign country outside the United States, then your worldwide income is subject to U.S. income tax. As an American expat, you are allowed an automatic two-month extension to file your return without asking for it. For a calendar year return, there is an extension to June 15, but you must pay any tax due by April 15 or interest will be charged, starting from April 15. If you qualify for this two-month extension but are still unable to file your return by that date, you can request another one until October 15 by filing Form 4868 before the automatic extension date. You are required to file your expat tax return even if you spent the whole year abroad, earned all your income outside the U.S. and paid tax to your current country of residence. Don’t be scared to file a tax return, as very often you may qualify for various exclusions and claim different credits, which relieve and minimize your tax liabilities. Depending on everyone’s individual case, you may be obligated to file a Foreign Bank Account Report (FBAR) and/or State income tax return. A FBAR has to be filed if the balance in all of your foreign financial accounts was, at any point of the year, $10,000 or more. It’s important to remember that this includes not just bank accounts, but also foreign pensions, investment accounts, and cash value insurance policies. For the 2018 year tax return, the due date of FBAR is April 15, with an automatic extension of six months, ending on October 15. Regarding state income tax returns, it depends on each state as they have their own set of rules as to who is considered a resident. In most states, residents are required to file an annual income tax return. As a U.S. expat, you have a few options to avoid double taxation: Foreign Earned Income Exclusion (FEIE), Foreign Housing Exclusion/Deduction, and the Foreign Tax Credit (FTC). It’s highly recommended that you catch up on your late tax returns and become tax complaint (and stay that way) without fear of being hunted by the IRS. Our tax experts have helped numerous expats with their tax returns. If you would like them to look at your case and provide you with qualified tax advice and services, do not hesitate to contact us now. Green card holders are considered to be U.S. persons for tax purposes by the U.S. government and are, therefore, required to file and pay tax returns. If you are a green card holder who has moved abroad or returned back to your home country and never officially given up your green card, then you are still subject to U.S. income taxation. Only those who have formally surrendered their green card, or have had it revoked or abandoned by a final determination, are not obligated to pay and file their tax returns. You can contact the USCIS to check the status of your card. To officially abandon your green card, you will need to file USCIS Form I-407 (Abandonment of Lawful Permanent Resident Status). If you are a long-term permanent resident (eight years or more), then you must file IRS Form 8854 (Initial and Annual Expatriation Information Statement) and you may be subject to Exit Taxes under IRC § 877A. This one imposes the income tax on the net unrealized gain on property held by certain U.S. citizens or green card holders who terminate their U.S. residency. This is imposed as if their worldwide property has been sold for its fair market value on the day before the expatriation or residency termination. Living outside of the country for a sufficient period of time may allow you to use the Foreign Earned Income Exclusion (FEIE) and the Foreign Tax Credit to reduce your tax liability. As a green card holder, your residency begins on the first day you arrive in the U.S. and doesn’t end until you formally surrender your lawful permanent resident status in the country. Therefore, an alien who visits the United States so infrequently that, on scrutiny, he or she is no longer legally entitled to permanent resident status, will be a resident for tax purposes. The purpose of this requirement of revocation or determination is to stop aliens attempting to retain an apparent right to enter or remain in the United States while attempting to avoid the tax responsibility that accompanies that right. You can always contact our team at 1040 Abroad, who have helped hundreds of green card holders to resolve complicated tax cases and come clean to the IRS. Contact us now to have your questions answered and receive professional advice from our tax experts. You are considered to be a resident alien of the United States for tax purposes if you meet either the green card test or the substantial presence test for the calendar year 2016 (January 1 – December 31). Even if you do not meet the tests, you may still be able to choose to be treated as a U.S. resident for the part of the year. If you are a lawfully permanent resident of the United States at any time during the calendar year 2016, then you are a resident for tax purposes. A commute from Canada/Mexico – If you regularly commute from Canada or Mexico to the U.S., then you cannot count commuting days as being days of residence for the purpose of the residence test. Tax Home – If you can prove that you have had a tax home in another country during the year and were not present in the United States for 183 days during the year. Under these conditions, a tax home is usually considered to be either the principal place of business or the primary residence of the person in question. If you wish to claim this exemption, you will need to file Form 8840 with the IRS. Tax Treaty Exception – The residence test does not override any definition of residence as specified in a tax treaty. A treaty with another country may exempt you from being classified as a resident, even if you otherwise meet the residence test. Medical Exception – Anyone who is involuntarily detained in the U.S. due to medical reasons can claim a medical exemption. For example, a foreign tourist who suffers a heart attack while in the U.S. and is hospitalized for three months can file Form 8843 and list the days that are spent here for medical reasons under this exemption. You are also eligible to qualify for personal exemptions and exemptions for dependents, according to a set of rules for U.S. citizens. Resident aliens can claim itemized deductions by using Schedule A of Form 1040. These deductions include some medical and dental expenses, state and local income taxes, real estate taxes, the interest you paid on a home mortgage, charitable contributions, casualty and theft losses, and miscellaneous deductions. U.S. resident aliens generally claim tax credits and report tax payments, including withholding, by using the same rules that apply to U.S. citizens. The following items are some of the credits you may be able to claim: child and dependent care credit, credit for the elderly and disabled, child tax credit, education credits, foreign tax credit, earned income credit, and adoption credit. As a nonresident alien, you are engaged or considered to be engaged in a trade or business in the United States during the calendar year. If you are or were temporarily present in the U.S. on any of the “F”, “J”, “M,” or “Q” visa, you need to file either Form 1040NR or 1040NR-EZ. However, you need to know that if the wages you earn from your only U.S. source of income are less than the personal exemption amount, then you are not required to file. The amount of personal exemption for 2016 is $4,050. Generally, a nonresident alien, single or married, can claim only one personal exemption for himself, as long as he/she is not claimed as a dependent on any other U.S. tax return. There are a few exceptions to this rule, which you can find here. However, if your only U.S. business activity is trading in stocks, securities, or commodities (including hedging transactions) through a U.S. resident broker or other agents, you are NOT engaged in a trade or business in the United States. You must file a return if you have U.S. income on which the tax liability was not satisfied by the withholding of tax at the source, even if you are not engaged in a trade or business in the United States. You should also file an income tax return if you want to claim a refund of excess withholding or the benefit of any deductions of credits (for example, if you have income from a rental property you choose to treat as income that is connected to a trade or business). As a nonresident alien, you are required to file either Form 1040NR, U.S. Nonresident Alien Income Tax Return or Form 1040NR-EZ, U.S. Income Tax Return for Certain Nonresident Aliens With No Dependents, if qualified. Your income that is subject to U.S. tax is divided into two categories: a) Income that is Effectively Connected (ECI) with a trade or business in the United States; b) Fixed, Determinable, Annual, or Periodical (FDAP) income. Effectively Connected Income (ECI) is taxed at graduated rates and it should be reported on Form 1040NR. Mostly passive investment income makes up FDAP income, but it could theoretically be any sort of income, and it is taxed at a flat rate of 30%. There are no deductions available for this. It should also be included in Form 1040NR on page four. You generally have to file your tax return by the 15th day of the 4th month after your tax year ends if you are an employee/self-employed person and receive wages or non-employee compensation that is subject to U.S. income taxation, or you have an office or place of business in the United States. The date is generally April 15 for a person who files using a calendar year. However, if you are not an employee or self-employed person who receives wages/non-employee compensation that is subject to U.S. income tax withholding, or does not have an office or place of business in the United States, then you must file by the 15th day of the 6th month after your tax year ends. For a person filing using a calendar year, this is generally June 15. If you cannot file your return by the due date, you will need to file Form 4868 to request an automatic extension. You must file Form 4868 by the regular due date of the return. All aliens need to obtain a certificate of compliance before leaving the U.S. This document, also popularly known as the sailing permit or departure permit, must be secured from the IRS before leaving the U.S. You will receive it after filing a Form 1040-C, U.S. Departing Alien Income Tax Return, or Form 2063, U.S. Departing Alien Income Tax Statement. Even if you have left the United States and filed a Form 1040-C on departure, you still must file an annual U.S. income tax return. If you are married, and both you and your spouse are required to file, you must each file a separate return, unless one of the spouses is a U.S. citizen or a resident alien, in which case the departing alien can file a joint return with his or her spouse. American tax laws make it clear that it doesn’t matter if you have dual citizenship. As long as you hold American citizenship or you are a green card holder, then you are liable to pay U.S. taxes. The United States is one of two countries in the world, where a tax on foreign income is based on citizenship and not a residence. Therefore, when you are considered a U.S. person for tax purposes – which is 100% correct if you have American citizenship – you are required to report and file a tax return to the IRS. As a dual citizen who doesn’t live in the U.S. anymore, or doesn’t intend to do so in future, you can consider renouncing your citizenship to avoid the tax implications that come with it. This is not a light decision to make and you will need to think about it carefully before making any decision, but it may relieve your life in terms of your tax burden in the long-term. An Accidental American is a citizen of a foreign country other than the U.S. who may be considered an American citizen under the U.S. nationality law. This rule leaves an opportunity to pass citizenship through a few generations without people realizing it. You do not have to register with the U.S. government or apply for a passport to become a U.S. citizen. By being born in the foreign country to one U.S. citizen parent who emigrated from the U.S.
By being born in the U.S. to foreign parents who were temporarily residing in the country for work, study or other reasons, and then returned to their home country shortly afterward. By acquiring another citizenship, thinking that it ended the American one. At the same time as finding out about their new status, many Accidental Americans also become aware of the U.S. tax filing requirements and penalties they can face for being non-compliant. But it’s important to understand that Accidental Americans have non-willfully violated tax laws, meaning they were previously unaware of their obligation to pay U.S. taxes. Because of that, they are eligible to use the Streamlined Procedures, which allows them to become tax compliant without facing penalties. You will need to file the last 3 years of U.S. tax returns and six years of FBAR, and report your financial accounts abroad if they have had an aggregate value of $10,000 or more at any time during the tax year. You may want to renounce your U.S. citizenship, but it will not free you from your tax filing obligations. You can renounce without being tax compliant, but this is not usually the best choice as the IRS could still expect you to file returns. Relinquishing citizenship without being five years tax compliant will mean that you are considered a “covered expatriate” and fall under the rules for the U.S. Exit Tax. In addition, the IRS has no reason to waive or reduce the outrageous penalties imposed for failing to file some of the forms now that you are no longer a citizen. Another thing to remember is FATCA, which impels taxpayers to report their foreign assets and foreign financial institutions to report on behalf of their American clients. If you think that your bank won’t report, then you should know that this law has a real global reach with foreign financial institutions facing a mandatory 30% withholding of their US-sourced income. American account holders will also need to certify that they are compliant with U.S. tax obligations or there is a risk they will have their accounts closed. Nowadays, banks are looking for signs that any of their customers are U.S. citizens, and if a banker sees that you were born in the U.S., as indicated in your passport’s place of birth field, then you will be asked to fill out a W-9 form, provide a Social Security number and certify that you are compliant with your U.S. taxes. Don’t be scared to catch up with your U.S. taxes as an Accidental American. Our tax experts have helped many dual citizens become tax compliant and are familiar with the best options to execute this process.